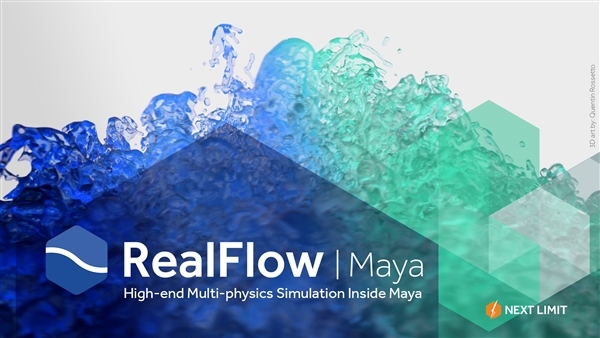 RealFlow | MAYA gives you the best in fluid simulation, directly inside Autodesk Maya. This new version is built on RealFlow's 10 Dyverso multiphysics solver - so you get the best in fluid simulation quality and performance, with an easy workflow. RealFlow | Maya gives you the best in fluid simulation and more, directly inside Autodesk Maya?. Now it is faster and easier to simulate granulars, viscous, viscoelastic, rigid, and elastic materials with an even easier and faster workflow. Achieve high-end GPU-accelerated simulations from inside the Maya? interface. The entire range of fluids and materials is GPU-accelerated. You won?t believe how fast fluid simulations can be with RealFlow | Maya. Unleash your ideas with more turnarounds in less time! And the best thing is that you are not tied to a certain platform. With CUDA and OpenCL you are free to explore different technologies and protect your hardware investment. Are you tired of using exchange tools? With RealFlow | Maya, connectivity plugins are a thing of the past. Everything is based on an Alembic pipeline directly inside Maya?. Turn objects into obstacles and emitters, render complex meshes or create particles from complex splines. Support for nParticles and even MEL included. Objects are essential and we put a strong focus on particle-object interaction. RealFlow | Maya works with all of Maya?s internal object types including NURBS. You can use objects as obstacles and containers, let animated bodies collide with fluids to create impressive splashes, and control the interaction through a wide range of physical properties such as friction, stickiness or bounciness. Forces are a key element in RealFlow |Maya and they are introduced through a wide variety of daemons . Many daemons can be controlled and limited with completely customizable falloffs to shape their behaviour and scope. Typical examples are gravity, attraction or wind. Creativity and control. Impressive crown splashes, entwined spline emitters, swirling splashes, and thin sheets of fluids moving in slow-motion. All this ? and many more ? is right at your finger tips with RealFlow | Maya. Initial states can be created from arbitrary simulation frames and used as a starting point for a new simulation pass. This feature does certainly not sound very spectacular, but initial states are definitely on of the biggest time savers in RealFlow | Maya. This smart tool transfers position and velocity information from rigid and elastic material particles to objects to make them behave like rigid or elastic bodies. But you can also use liquid, viscous, viscoelastic or granular particles to deform and move objects ? and to explore new creative worlds with abstract shapes. Objects and textures work both ways in RealFlow | Maya. You can use the object texture to emit particles, customize properties like its friction or generate new textures where particles leave wet marks on an object?s surface. RealFlow commands are exposed for scripting. Query your particles information for unlimited possibilities. RealFlow | Maya is available for Autodesk Maya? 2017 and 2018 (Windows, Linux, macOS).